dancing the breeze, originally uploaded by HeadsUp_Dad. At last, spring is finally here and what a great time to enjoy everything about it – the warmth, the sound of birds singing, and buds appearing on the trees. It won’t be long before you see the colours of flowers appearing in your neighbours’ gardens or before you begin to plant your own. Until then, here is an activity for dads to enjoy with your children. A chance to fill your home with the colours and aromas of flowers, and to welcome spring as you spend time together engaging in creative play! *This activity can also be done using regular food colouring, if you have some. The filters could also be coloured using scented markers! Prepare three or four small bowls of “dye” by dissolving a heaping spoonful of gelatin powder in hot water. The colours available are quite bright and produce good results. The gelatin also smells really yummy! Talk about which colour is your favourite, and why. Encourage your child to guess the smell of each different gelatin. Is it strawberry? Grape? Lemon? Children learn important concepts using their senses. Next help your child to fold the coffee filter in half three times, until it resembles a small cone. Clip a clothes peg to it, to make dipping the filter into the dissolved gelatin easier and a little less messy. Dip the filter into the different colours until you have covered as much of it as possible. This part of the activity helps your child to practice using the small muscles in the hands and fingers and to co-ordinate movements. Carefully open up the filter to reveal the “tie dyed” flower that you have created. Allow the filter to dry. When it is ready, pinch the centre of the filter, and wrap a pipe cleaner around this, to create a stem. Repeat this process with many filters to create a beautiful spring bouquet. Invite your child to select a container for the flowers and to make a display for the dinner table! This will build your child’s pride in his or her creation. 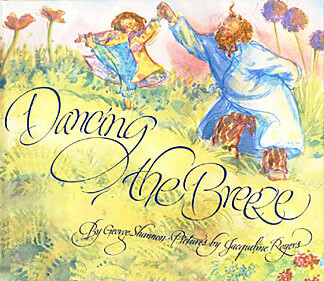 To extend the activity, go to the library and sign out of a copy of the book Dancing the Breeze by George Shannon. This is a beautiful book about a father and daughter dancing together in the garden by the light of the moon. You can explore the different names of flowers, while enjoying the author’s poetry. If you feel inspired to do this, put on your favourite music, wave colourful scarves and invent your own flower dance!